Renting a property is now cheaper than buying in over half of British cities, according to new data, suggesting that house prices may be approaching a peak. Property website Zoopla analysed the monthly cost of renting a two-bedroomed home, compared to servicing a mortgage, in the country’s 50 largest cities. The proportion of locations where it is now cheaper to rent has increased by 14 per cent since October 2016, when it was more cost effective to buy in 60 per cent of British cities. Across Britain’s 50 biggest cities, the average monthly rental payment on a two-bedroom home is £690, which is £47 less per month than average mortgage repayments of £737. The figures assume a buyer is purchasing the median-priced home with a 90 per cent loan-to-value mortgage. The figures will add to evidence that house prices may have reached their peak, particularly in high value areas such as London and the South East. A long period of low interest rates as well as government schemes to assist people with house deposits has made buying more attractive and helped to push up prices. Any rise in interest rates from their current historic lows would add to mortgage repayments, making them less affordable. At a regional level, the research found that rents are cheapest relative to mortgage repayments in the highest-value areas. Despite paying for some of the most expensive property in the UK, Londoners’ average monthly rents of £1,861 are dwarfed by mortgage repayments in the capital, which come in at £3,001 per month - a massive 47 per cent gap. Cambridge has the next largest discrepancy, with average monthly rents 30 per cent less than a mortgage, followed by Brighton where renting is 27 per cent cheaper. 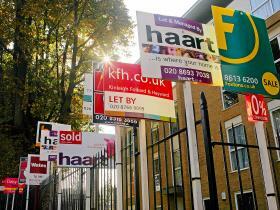 Glasgow and Dundee top the list of locations where buyers pay less than renting on average. In Glasgow the average mortgage repayment is just £174, which is 31 per cent less than monthly rent. Dundee is second on the list with rents of £549 per month - 29 per cent less than the cost of a mortgage. Yorkshire also appears to be a good location for those looking to buy a property, with the cities of Bradford, Barnsley, and Leeds all featuring in the top 10 places where owning is cheaper than renting.